Saltillo tile (sometimes referred to as Mexican tile) is durable, but over time it can become worn out or stained. You can refinish Saltillo floors at home. The process is fairly long with several steps but is not difficult. Saltillo style is a type of ceramic tile, mixed by hand and poured into molds. It's dried in the open or in a kiln until it becomes hard and is recognizable as a floor tile. It tends to have a more rustic look thanks to its homemade construction, with each tile featuring a slightly different color and surface finish. Why Would Mexican Tile Floor Need Restoration? Saltillo tile is typically unfinished, meaning it isn't treated with any varnish or glaze. The result is that it has a porous surface which can absorb spills and lead to Saltillo tile stain issues. You can use this porous nature to stain your Saltillo tiles to a depth of your choice. You can also glaze or seal your tiles to prevent future staining. To restore and protect your Saltillo tiles, use household items, followed by a few special techniques. In order to restore your Saltillo tile floor, first ensure the floor is totally clean. First sweep and vacuum the floor in order to remove any loose debris, then clean with a mop. 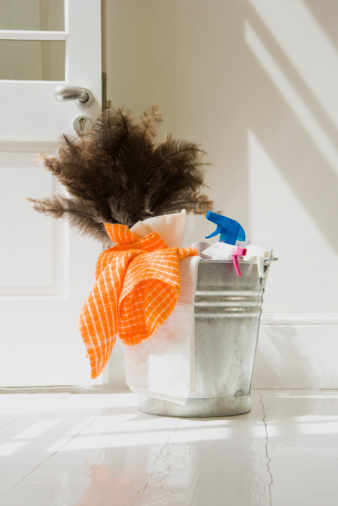 You can make a Mexican floor cleaning solution from vinegar and water. Mix the two together: one part vinegar to two parts water. Apply this mixture to the floors, but do not allow it to sit on the tiles for too long. Their porous nature means they are susceptible to water damage. As you mop, follow with a towel to absorb excess moisture. You may want to work your Saltillo floor in segments to make this process easier. Next, remove any old sealant covering the top of your tiles. 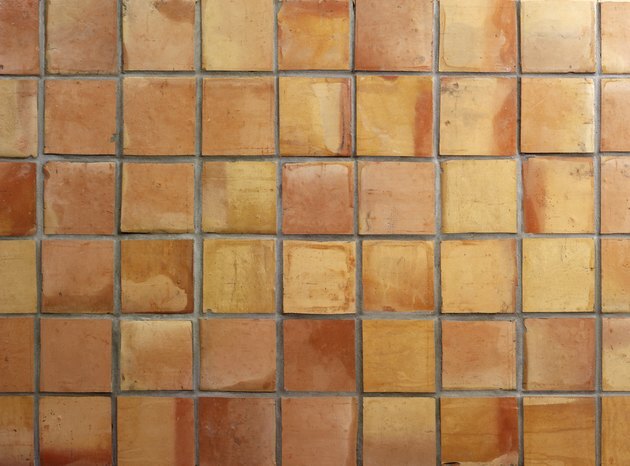 Older sealant can also begin to yellow, which can give your Saltillo tiles a dingy or discolored look. If you are planning to deliberately stain your Saltillo tiles, you'll also need them sealant-free to allow the stain to absorb. To remove your tile sealant, you need to use a chemical stripper. Spread the tile sealant stripper across your floor using a mop. Allow 20 minutes for the sealant to sit, or more depending on the instructions of your sealant stripper. Then remove the stripper using more of your vinegar and water mixture. If you have a spillage stain on your Saltillo tile, this is the time to remove it. The best way to remove stains from Saltillo tiles is to use a mixture of half acetone and half water. Blot this over the stain with a sponge until it lifts. Remove the residual acetone with water. If you are just restoring your Saltillo tiles through deep cleaning, you can now apply a new layer of tile sealant. However, if you want to restain your tiles, this is the time. Dry the tiles with a soft cloth. Then, using a clean brush, apply your stain in circular motions. This helps prevent streaking. Allow the stain to dry and evaluate your results. You can add further coats if you want, to get your Saltillo tile to the required depth of color. Once you're happy with the shade, you're ready to re-seal your Saltillo floor. Spread your sealant with a clean mop, according to instruction. Allow at least 24 hours for the sealant to dry before you begin using the floor again. Can You Stain Terra-Cotta Tile Floors?